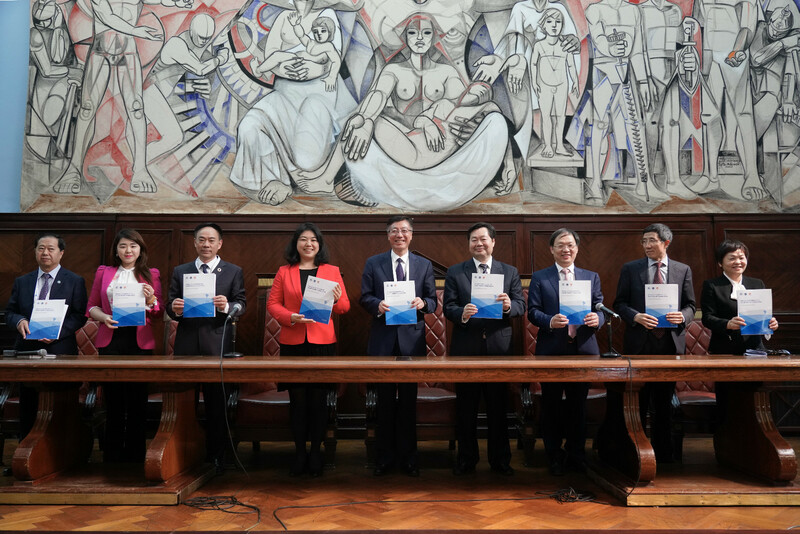 Under the framework of the Second High-level UN Conference on South-South Cooperation “BAPA+40” conference, was successfully held the South-South Cooperation for Agricultural Development Local Experiences and Global Partnership for SDGs19 side-event on March 21, 2019, in Buenos Aires, Argentina. During the event was launched a joint multimedia report by FCSSC, Phoenix TV and China Institute for South-South Cooperation in Agriculture of China Agricultural University, titled “China’s Contribution to South-South Cooperation.” The report further explores and analyzes using case studies to reflect what has been China’s contribution to the process of South-South Cooperation, especially in the most recent period. The video version of the report was executed by Phoenix Satellite TV, including a series of case documentaries broadcast on Phoenix Satellite TV titled “Odyssey of The Dragon"; the paper version, Report on China and South-South Cooperation, was executed by China Institute for South-South Cooperation in Agriculture of China Agricultural University . It is hoped that through such innovative cooperation, it keeps raising awareness about South-South Cooperation in the world. South-South cooperation has gained a strong momentum since the new millennium in which emerging economies have played an increasingly important role. China is a unique one of them. It is not only an actor and supporter of SSC but also a leading contributor to this process in many aspects. Long been safeguarding principles of globalization, the country recently proposed a concept of “building a global community with a shared future" that responded to the UN’s 2030 agenda for sustainable development. It aimed to achieve this goal through its grand Belt and Road Initiative, combined with its special models of SSC. China’s Contribution to South-South Cooperation: Cases and Implications are thus assembled in this broad context. The report does not interpret this subject from the policy angle, but instead, it presents several case studies to reflect on China’s contribution to this process, especially in the most recent period. Though not exhaustive, this report touches on six important fields that China has been working on, from industrial development, agricultural technology transfer, trade facilitation, health crisis management, infrastructure development, to capacity building. One mini case of the civil society’s engagement further widens the spectrum. More importantly, these cases not only talk about success stories but also share useful lessons and challenges, aiming to initiate broader discussion and exchanges among various actors engaged in either North-South cooperation or South-South cooperation. The launching ceremony was moderated by Ms. Ji Lanlan, Assistant Dean of the China Institute for South-South Cooperation in Agriculture of China Agricultural University.